In a world of widening extremes, plastic fills the oceans, an insect apocalypse threatens the delicate balance of natural ecosystems and a million dead fish rise from the depths of the Murray-Darling Basin. Dread and hopelessness come naturally in the face of these overwhelming crises, but optimism still manages to persist. Harvey Sutherland’s rolling samba keeps a relentless pace, punctuated with a loping gospel mantra – they say there’s something in the water – delivered by Jace XL, whose past credits include live and studio recordings with Hiatus Kaiyote; backing vocals for Sampa the Great; and ‘Sacrifice’, a 2016 EP with Silent Jay released on Rhythm Section International. 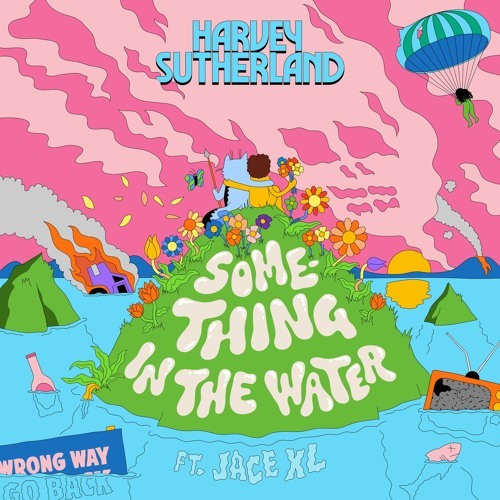 SOMETHING IN THE WATER is the first single from Harvey Sutherland’s new studio band, which comprises long-time drummer Graeme Pogson, percussionist Phil Binotto and bassist Luke Hodgson. It was recorded and produced at Harvey Sutherland’s velour-lined recording studio that might just come in handy as a survival bunker when the approaching apocalypse hits Melbourne’s inner-northern suburbs. Vocals: Jace XL Drums: Graeme Pogson Bass: Luke Hodgson Congas: Phil Binotto Keyboards: Harvey Sutherland Written, recorded, produced and arranged by Harvey Sutherland. Lyrics by Harvey Sutherland and Jace XL. Mixed by Haima Marriott Mastered by Wouter Brandenburg Illustration and design by Nicko Phillips A Clarity Recordings release. Distribution through Republic of Music and Caroline Australia Harvey Sutherland works and lives on country belonging to the Wurundjeri people of the Kulin Nation. Respect is paid to First People and their elders past, present and emerging. Sovereignty has never been ceded. Incredible, very beautiful song !